Patients, survivors and their families joined medical staff in a day of fun and entertainment sponsored by the John Theurer Cancer Center. 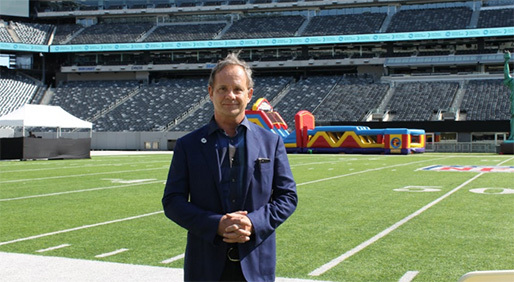 Patients, survivors, loved ones and members of the medical community gathered at MetLife Stadium for the event. 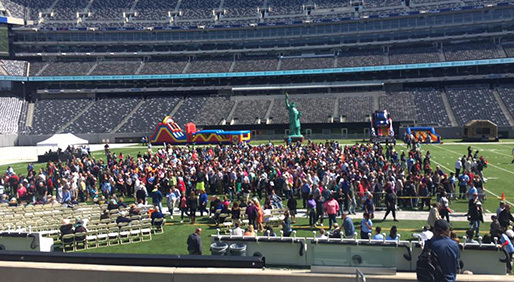 Spirits were high this past Sunday, Sept. 10, as patients with cancer, survivors and their families, as well as medical staff, gathered at the Celebrating Life and Liberty event at MetLife Stadium in New Jersey to revel in another sunshine-filled day on this planet. Compared to last year, when 4,000 guests shivered in a chill September rain and huddled under overhangs, this year’s weather was, you could say, just what the doctor ordered. This event, now in its ninth year, is sponsored by the John Theurer Cancer Center at Hackensack University Medical Center. It celebrates survivorship, while also generating inspiration and support to those in the cancer community who are still in treatment or recovery. Teens waved at cameras that projected them onto the jumbotron while children bounced through inflatable obstacle courses. Others acquired temporary airbrush tattoos and free sweatshirts, and posed with a living Statue of Liberty. Some Giants fans had their dreams come true as they ran across the stadium field kicking footballs through the goalposts. “It’s a way for people to let go of their worries and concerns for a few hours and be surrounded by others who have survived, and to see that there is hope,” said Ihor S. Sawczuk, M.D., FACS, president of Hackensack University Medical Center. Trisha Coote, a breast cancer and ovarian cancer survivor, proudly posed for a picture with her goddaughter Shoshauna Wallace. “Their courage and perseverance inspires us,” Robert C. Garrett, FACHE, co-chief executive officer of Hackensack Meridian Health, added. “When I started in the field, children were dying from leukemia at the rate of 70 to 80 percent, and today there is a 70 to 80 percent survival rate. The landscape of survival has changed so much. Garrett and other leaders from the John Theurer Cancer Center at the Hackensack University Medical Center and the overarching Hackensack Meridian Health system addressed the crowd briefly, thanking them for allowing the hospital system to be a part of their cancer journey. They also thanked the medical staff at the cancer center, who contributed to the continued survival of many of the attendees. The leaders also shared news of some developments that would help improve their care in the future, including a partnership with Memorial Sloan Kettering Cancer Center and a partnership with Georgetown University which will allow them become a National Cancer Institute-designated cancer center. They also announced their plan to build a new tower at Hackensack University Medical Center with 24 new operating rooms, 50 surgical beds in an intensive care unit and 150 single-patient rooms, many of which will be dedicated to patients with cancer. They are hoping to break ground in the first quarter of 2018. The tower will take about five years to build. There was an educational element to the Celebrating Life and Liberty event as well. Fifteen advocacy organizations were invited to participate, offering information and resources to attendees. “We hope that patients and their families stop by the advocacy groups and learn something new, whether it is about nutrition, lifestyle change, access to services you might need and didn’t know that you could access … getting everybody together who service people with cancer is always a good thing,” said Sawczuk. Attendees Howard and Mary Goldman enjoyed dancing to the music. "We dance our way through life," Mary said. "You have choices. We choose to dance."